Written by Anna Pääkkönen BSc Hons Zoology, Sea Watch Foundation 2015 Research Intern. The increasing noise pollution in our oceans is a major concern for marine mammals, specifically dolphins and whales who use their hearing as their primary sense to navigate, communicate and find food. Sources of human made, or ‘anthropogenic’, noise underwater are for example; shipping, seismic surveys used in oil exploration and military based training, including sonar and explosives. Military sonar has been observed to be the biggest threat to dolphins and whales as the sound can seriously injure the animals’ hearing. The US navy recently announced that they will limit the use of military sonar in their training to protect whales and dolphins. As a result of the limitations, the navy will not be using military sonar at all in certain established whale and dolphin habitats and migration routes. This is a huge success for many conservation groups demanding the limitation of naval acoustic disturbances, and of course the dolphins and whales themselves. 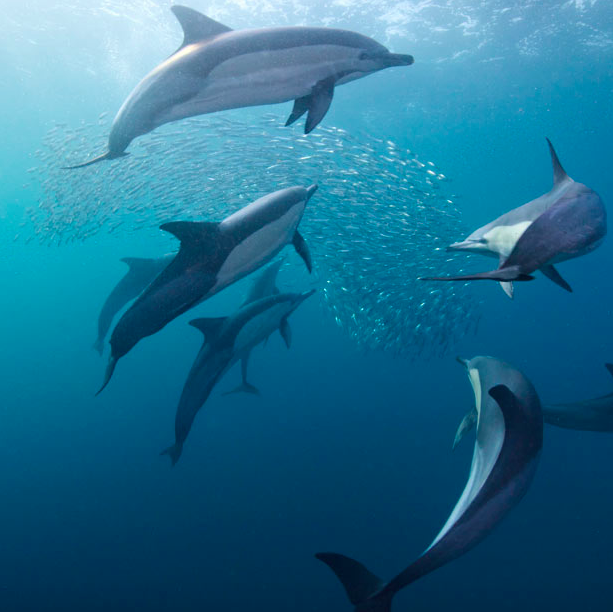 Dolphins and whales use echolocation to find food, each other and to navigate. Photo credit National Geographic Creative. So how is noise pollution in the seas harmful for cetaceans? 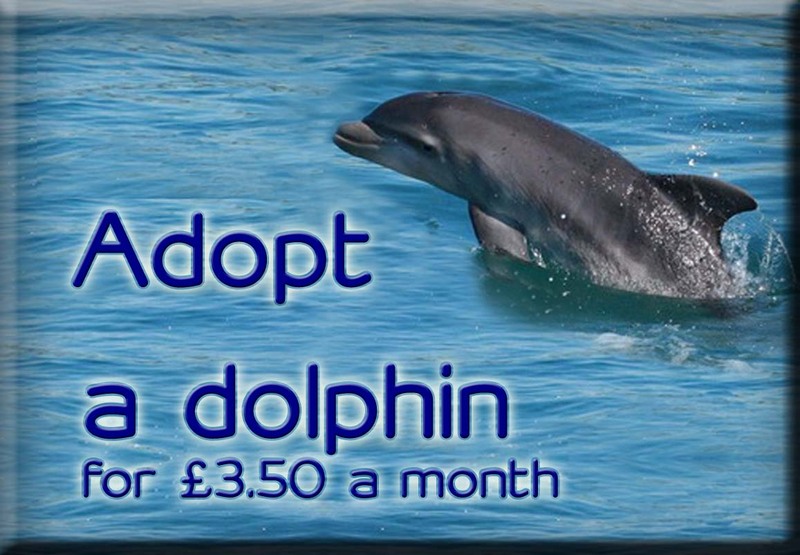 Cetaceans – whales, dolphins and porpoises – rely on their hearing as their primary sense for survival. 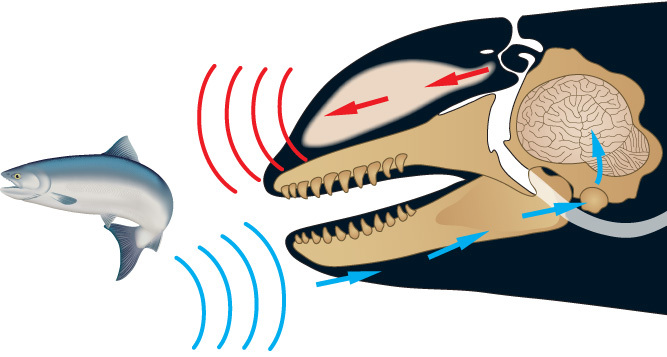 To understand this, you need to understand how the animals’ hearing and echolocation works. If you have seen any film with a submarine in it, you probably know the basics of how sonar works. A sound wave, or in the case of cetaceans a click, is emitted into the surroundings from the melon at the front of the cetacean’s head. The waves returning to the submarine, or the cetacean’s lower jaw, are translated into information about its surroundings. This helps the whale or dolphin navigate, find food and other whales and dolphins. For this reason any damage to the animals’ hearing can have very serious consequences. Dolphins and whales use echolocation to find their prey. 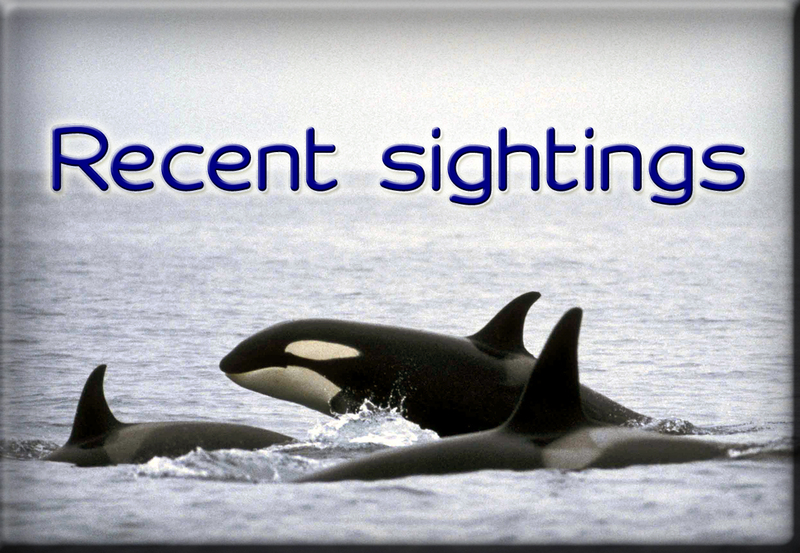 Photo credit Listening For Orcas. 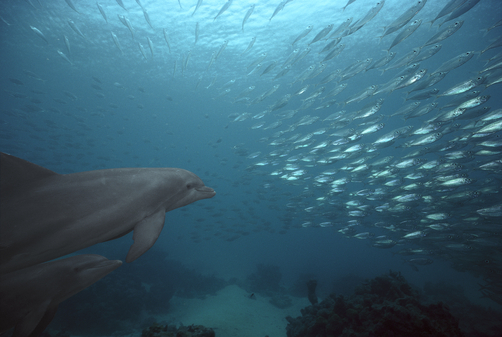 How does underwater pollution harm cetaceans? Underwater noise pollution can be harmful in several ways. Firstly, a noisy environment can drown out the animals’ own sounds, making it harder for them to communicate, navigate and detect prey. The louder background noise can mean that the animals have to ‘shout’ to be heard, and the animals use more energy as a result. When you use more energy, you need more food. When finding food in the noisy environment is already harder, this puts the animals’ health under risk and this can affect its ability to carry and care for its young. In addition, as most of us can understand, a noisy environment can be very stressful. Secondly, a sudden, loud noise (naval sonar, for example) can cause permanent damage to the animals’ hearing and can even be fatal. Deep diving species may change their diving pattern as a panic response to the noise, and this can cause the condition we know as decompression disease or ‘the bends’; when scuba divers surface too quickly and gases (mainly nitrogen) form bubbles in the blood. Dead cetaceans with this condition have been found following high volume military exercises in the area. Different types of vessels that use sonar which could disrupt the natural echolocation used by dolphins and whales. Photo credit Collective Evolution. Sometimes the panic from a sudden loud noise can also result in the animals fleeing towards land and stranding themselves. Mass strandings have been mostly observed in highly social species of beaked whales. The seriousness of the threat posed by naval training became apparent in 2000, when dolphins and whales of several species stranded on the beaches of the Bahamas. 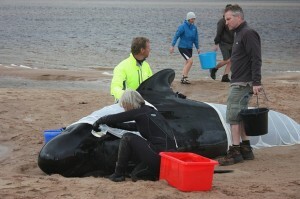 Examples of recent mass strandings in the UK include the mass stranding of 39 long-finned pilot whales in 2011 in Scotland and a group of common dolphins stranding on the shores of Cornwall in 2008. In both of these cases a government report later revealed that the likely reason for the mass stranding was naval underwater detonations. Could wind farms pose a threat to marine life? Wind is a great form of energy to utilise and use as a form of renewable energy. Unfortunately, the building of wind farms in the sea is actually a source of a lot of noise, and therefore a threat to marine animals. The piling of wind turbines generates a loud sound which travels long distances in the water. 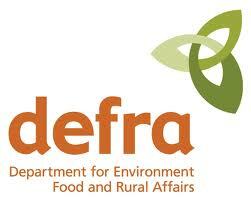 The noise could therefore potentially drive animals away and result in them avoiding the previously favoured habitat. On the positive side, some studies suggest that once built, the wind farms develop a reef around them and this may actually attract more marine wildlife. 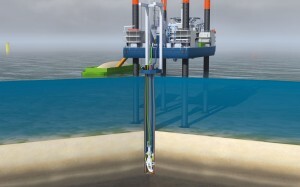 Piling the foundations of wind farms creates a lot of underwater noise, and disturbs cetaceans and other marine life. Photo credit Bine Information Service. What about other marine species? Noise pollution also affects other marine species. Seals are affected in similar ways as cetaceans, as they also use their hearing for daily tasks and they may even be able to use echolocation to some extent. In addition, many species of fish have been observed to be negatively affected, and this of course directly affects cetaceans and seals that use fish as their primary food source. What is being done to restrict the amount of noise pollution in the seas? In addition to the limitations put in place by the US navy, luckily here in the UK there are some regulations and limitations in place already. These include regularly assessing possible cetacean habitats, ways of minimising impact on marine wildlife in Royal Navy’s basic training and increasing the intensity of sonar gradually so that the animals can begin to move away from the unpleasant sound. 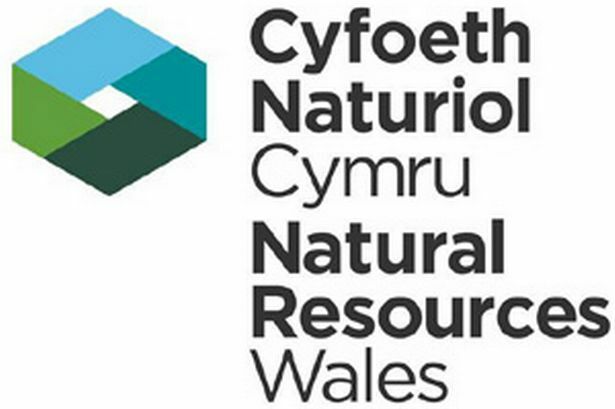 Furthermore, assessments of the impacts of different sources of noise to marine life and the identification of important cetacean habitats, breeding grounds and migration routes are done regularly. Dependence on their hearing and echolocation is what makes cetaceans so vulnerable to human made noise pollution in the sea. Just like other kinds of pollution, looking into ways of reducing it, as well as monitoring populations and assessing how they are affected by the noise, is vital to conservation of cetaceans and other wildlife in our seas. What Caused the UK’s Largest Common Dolphin (Delphinus delphis) Mass Stranding Event? Navy sonar and cetaceans: Just how much does the gun need to smoke before we act?